Deep Purple History: It was here that Deep Purple Mk 1 all lived prior to their first American tour. The Details: Deep Purple were originally living in Deeves Hall, but when that became unavailable, their managers set them up in a number of hotels until they could rent a house. This was Number 13, Second Avenue, Acton Vale. Developed in the Victorian era, the street was further extended in the 1930s. 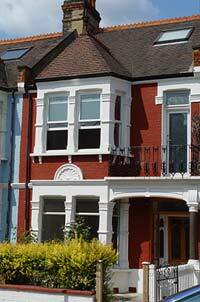 Number 13 was one of the handsome Victorian terrace properties. Blackmore and his girlfriend had one room upstairs, Jon and Nick shared another, and Rod and Ian shared the third (downstairs we think). The living room and kitchen was communal. The group lived here right up until they left for their first American tour in October 1968, after which the managers ceased renting it. Today: The street is still residential and (on the whole) nicely maintained. Number 13 is a private residence. Getting there: Second Avenue is three quarters of a mile from the Shepherd's Bush tube, on the right hand side of the the A4020, just after the traffic lights where Uxbridge Road becomes The Vale.